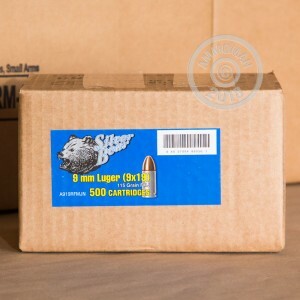 Are you planning a day at the range, or just wanting to stock up on some great 9mm Luger ammunition? 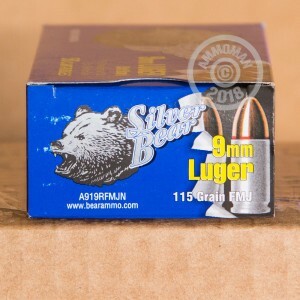 Then check out this ammo, from Silver Bear! This ammo is affordable and reliable. It has nickel-plated steel cases, which provide a cost savings over brass, while still functioning and feeding cleanly into your pistol every time. 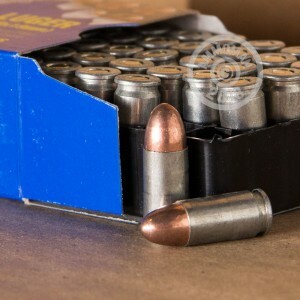 This round features a 115 grain full metal jacket projectile, which is the most common grain weight and bullet type, for 9mm Luger. This ammunition is perfect for a day at the range, practicing marksmanship skills and shooting techniques. Order some of this great ammo today, and get ready for a fun day at the range! Silver Bear ammunition is owned by DKG, which also owns Brown Bear and Golden Bear ammo. These ammo product lines offer the best prices, for each round type, to the American gun owner. I had many failures to fire between a Glock 26 and a Styer C9A1. The G26 had been flawless through 1000's of rounds before this. All rounds but one fired the second time through. Out of 500 we expirenced around 20-25 failures. Would not buy this Silver Bear ammo again. Numerous ejection issues in the five boxes I have fired so far. Guess I got what I paid for. From the first magazine I could tell this ammo was a waste. At least three ejection issues with every mag. I don't know if it was the steel casing or if it is just garbage ammo. I stopped using it after about 100 rounds because it just felt unsafe. I am just going to throw away the last 400 rounds. I bought this ammo on 7-9-16 and receive it on 7-13-16 and I used 50 rounds on my Beretta 92FS for the weekend. Never would have imagined the great quality of this ammo. No misfire or any problems with them, will definitely buy some more and have some fun on out on the shooting range. I was pleasantly surprised by this ammo. Scored a box if 500 on sale for 99 dollars and so far i have run 150 rds through my Springfield XDS 9 and 150 rds through my Ruger SR9 and both have had ZERO stovepipes and ZERO FTE'S. For range practice and having fun this is a good ammo. Just don't let it sit around too long as it does the corrosive Berdan primers. Fired 100 rounds and they worked fine. Only had 1 misfire out of the 100 .